My grandmother, Annetta Ginsburg, was a captivating storyteller. With a regal British accent from her life in colonial Singapore, she adeptly narrated a dramatic family history, which spanned generations and continents. Her proper Queen’s English was mixed with Malay phrases and a colloquial syntax, reminiscent of the Yiddish spoken in shtetls her grandparents had left behind. In 1986, I informally interviewed my grandmother in her peaceful San Francisco apartment, high atop Nob Hill. My portable cassette recorder was set on the dining room table, where we sat drinking tea. I did not know how precious that recording would become. My grandmother, who was 81, died shortly thereafter. In the late 1800’s my grandparents, Abraham and Rosa Frankel, were living in a poor Jewish village called Drushkininkai in Lithuania. The pogroms were making life hard for them. Abraham’s friend warned them, “The Cossacks are coming. You’ve got to leave.” My grandfather said, “We will go to Borneo. I have a cousin who went to Borneo to prospect for gold, and he’s doing very well.” So, my grandparents left with their two small children, my mother, Marie, and my uncle Julian. They spent two months on a boat, most definitely not first class. My grandmother said it was a very hard trip, because she kept kosher, and all she could eat on the ship was hardtack and tea. Hardtack is a very hard biscuit, typically eaten by sailors at the time. When they got to Borneo, my grandmother looked around, and there was no Rabbi, there was no kosher butcher, there were no Jewish people. Who would her children marry? So, Granny turned right back around and sailed back home with the two children. The Rabbi was surprised to see Granny back in their village. He says, "I thought you went to join your husband." She says, "Yes, I went, but you know there are no Jewish people there. I can't teach the children of their religion.” The Rabbi replied, "You go back. You can talk, you can tell your children of your religion. It's a bigger sin to leave your husband." In the meantime, the gold prospecting hadn’t gone well for my grandfather in Borneo, so he had transferred to Kuala Lumpur to a tin mine there. He used to tell us how he'd work in the mines and leeches would go into his legs and he'd have to pick them out every day. He earned fourteen cents a day. 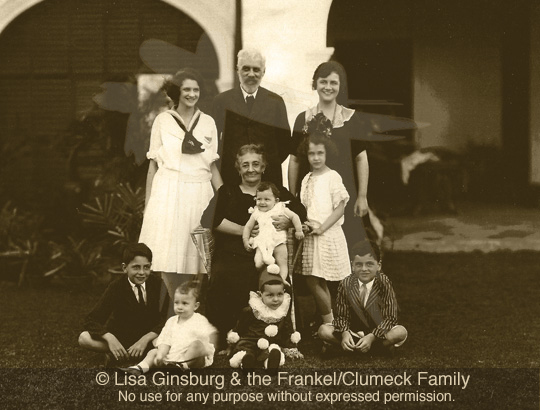 Fortunately, during the time it took Rosa and the children to rejoin him, my grandfather had heard that there was a Jewish community in Singapore. He also knew it was run by the English who had a reputation for being fair. They decided to try to make a go of it there. When my grandparents arrived in Singapore in 1888, they only spoke Yiddish. When Granny went to the market, she'd bring an eggshell to tell the man she wanted eggs or a chicken feather if she wanted to buy a chicken. Granny was a very good baker, so they rented a place where she could have a bakery downstairs, and they lived upstairs. Granny’s was the first bakery in Singapore and it became a great success. When Granny was expecting another baby, my grandfather went to a furniture auction to find a bassinet. There were such bargains; he couldn’t resist buying up a lot of furniture. The furniture that didn’t fit upstairs, he left downstairs in the bakery. People came in to buy the baked goods, liked the furniture, and bought the furniture. My grandfather realized he was making good money with the furniture, so he started Frankel Brothers Furniture store. My grandparents prospered and had three more children, six in all. One day my grandmother heard a knock at the door. When she saw two nuns standing there, dressed in black robes with crosses around their necks, she slammed the door in fright. All she could think of were the pogroms back in her village. The nuns knocked again and said politely through the door, “Excuse me, we have noticed your children out playing about, and wanted to recommend our school for them. We promise we won’t try to convert them.” Well, it took some doing, but they convinced Granny to send her children to the convent school, which was the best education available. My mother Marie finished school at twelve, because girls weren’t expected to go further. The next step was marriage. It was a natural progression. At sixteen, she fell in love with Victor Clumeck, a tall, handsome and very charming man.He spoke French and danced the waltz beautifully. The story of how Victor Clumeck came to be in Singapore is quite another matter altogether. But, like my grandparents, he started from nothing. Victor Clumeck, who was my father, was born in Jaffa in 1876 when Jaffa was part of the Ottoman Empire. The rich Rothschild’s living in Paris had founded a French language school to educate boys in Jaffa, so, even though his parents were from Eastern Europe, French was his first language. His mother, Pearl, a great beauty, had been previously married four times (her husbands either died or they got divorced). When Victor was ten, his mother’s new fiancé moved to Saigon to work and sent money for her and Victor to come join him. They had to change boats in Singapore and get a French boat to go to Indochina. But before my father left Singapore, which was then a little place, he ran into Mr. Clouet. Mr. Clouet was a Frenchman who ran an import business and liked to speak with Victor in French. Mr. Clouet said, “What are you doing here in the middle of the day?” Victor replied, “Oh, I'm so happy. I'm leaving Singapore. My friend and I are going to New York where we can work and prosper.” And Clouet said, "Listen, what do you want to go there for? I hear the Americans are crooks. I need someone to help me in my business and you speak French.” My father was happy to finally earn wages for his work and the amount seemed like a great sum to him so he stayed with Clouet and never left for America. Clouet & Company sold cans of sardines, building materials, tiles and whatnot, all along the Straights Settlements. Clouet’s goods would come from France, then he’d have Chinese women stamp on his “Chop Ayam” (“Ayam” is rooster in Malay, and “chop” is mark) which meant it was a first class product from Clouet & Company. As a young man, my father became a partner with Clouet and did very well. Years later when Clouet retired, my father bought up the business from him and kept the name, Clouet & Company. In 1903, when Victor was 26 and already successful in business, he asked Abraham and Rosa for permission to marry their eldest daughter, Marie. The Frankels were extremely well off and wouldn’t have said, “yes” to just anybody. I remember their beautiful estate, “Siglap” which was right by the sea. It had over two hundred acres of coconut and rubber plantations. Of course, the rubber became extremely valuable during the wars and the Frankels became even wealthier. Every Sunday we would go to Siglap for tiffin (a British colonial term for a lunch or light meal). There was a grand dining room with a long table that seated twenty people. Servants would wait on us, bringing us the curries and Malaysian delicacies we loved so well. One servant, the punkah wallah, had to stand there endlessly, poor fellow, tugging on a rope which pulled the punkah (ceiling fan) across the ceiling to keep a breeze going for us in the hot humid air. When my parents, Victor and Marie, got married, Abraham bought them a onefloor cottage on Orchard Avenue as a wedding present. I was born a year later, when my mother was just seventeen. We lived in the cottage until I was seven. My parents had three of their six children while we lived there. The cottage was built on pillars, with high ceilings to help keep us cool in the tropical climate. We children used to play under the house, but awful turkeys would come after us. We'd scream and run away and call for the amah (nanny) to save us. The geckos also gave me a fright. They were always climbing the walls and ceilings silently. Suddenly they would cry out, “Chi chak, chi chak!” and startle me. My parents called our new estate, Warringa Hill. I had a room and a sitting room with windows opening out to the garden. I loved to hear the birds, the parrots and kookaburras, calling to each other. I could smell the fragrant jasmine drifting through my window. We lived such a charmed life. We had amahs, servants and Chinese cooks who did everything for us. None of us ever set foot in the kitchen, so we didn’t even learn how to boil water, let alone cook anything. It was a life of leisure. As children, we would play lawn tennis and swim in the sea. The men would go to horse races and cricket matches. We danced in the grand ballroom at the Raffles Hotel, with the gorgeous chandeliers. The prominent Jews formed a tight community and were included in high society. In 1921, the Governor of Singapore invited us to a dance they were giving for Prince Edward, The Prince of Wales, who was in Singapore on a round of the British Empire. He even danced with my Aunt Esther, who was twenty-one at the time and very vivacious. It was a high point in her life. We took our first trip to San Francisco for a holiday the following year. We didn’t know what America was like; we had always vacationed in Europe. We thought it was barbaric and filled with cowboys and Indians. My youngest sister, Joyce, was just two months old. The amah brought the baby's bathtub all the way from Singapore, because she liked it and didn’t want to do without it. Imagine us marching into the posh Fairmont Hotel where we were staying. The people in the hotel couldn't get over it, this troop - a mother, father, and six children, followed by an amah carrying a corrugated iron bathtub, as if they wouldn't have a bathtub at the Fairmont! I celebrated my seventeenth birthday on that trip to San Francisco. When we returned to Singapore, the entire Jewish community was excitedly awaiting Albert Einstein’s visit on 2 November 1922. Einstein was on his way to Japan to deliver a series of lectures and Chaim Weizmann, a leader of Zionism, asked him to stop in Singapore to fundraise for the creation of the Hebrew University in Jerusalem. This was just before he received the Nobel Prize. Menasseh Meyer, the wealthiest Jew in Singapore, hosted a reception for Einstein and his wife at his grand estate, “Belle Vue”. Many of my family attended. When the Einsteins came back on their return trip, my grandparents gave them a tour of Siglap and he marveled at all the beautiful trees. I married Charlie Ginsburg, who was fifteen years older than me, when I was twenty. He was a good friend of the family’s and I had known him all my life. We shared a love of literature and I always enjoyed talking with him. We had our three children in Singapore and would have stayed on, but Charlie suffered from manic-depression and the doctors thought the tropical climate was bad for that condition. We used to go to Switzerland for cures, but since San Francisco has such a mild climate and we already had family here, we went there instead in 1935. We fell in love with this beautiful city and decided to make it our home. Most of our family left Singapore during the 1920’s and ‘30’s to settle in San Francisco. The transition from our life in Singapore was easy, because San Francisco is such a world-class city. Auntie Esther, married to Lester Goodman, was able to continue her high-society lifestyle by living at the Top of the Mark, a penthouse at the top of the Mark Hopkins hotel in San Francisco. For decades their portrait hung in the lobby. Esther was a flamboyant and legendary socialite. Herb Caen called her “the Grand Dame of San Francisco” in his San Francisco Chronicle column. She had her own table at Trader Vic’s, where they serve her a special tray of the hottest curries. Then the war came. When we lived worlds apart in Singapore, we weren’t aware of the horrors the Jews faced in Europe. The Holocaust caught us completely unaware. We were living the life of luxury, while so many were tortured and killed. I can’t bear the thought of it. Part of my husband’s family had been living in France and for years we couldn’t trace them. We later found out they had all perished in a concentration camp. The Japanese bombing of Pearl Harbor too came as a complete shock. I remember my husband running to tell me with his face half covered in shaving cream, because the radio program had been interrupted with the announcement. Thankfully, there were only a few of our family left in Singapore when the Japanese invaded there. When they took over Singapore, they massacred people, threw others in internment camps and torpedoed ships filled with people trying desperately to escape. My brother Ned was still living there, running Clouet and Company. He had learned to fly planes for recreation, so he joined the RAF and flew planes to help evacuate women and children. In Sumatra, Ned stopped to help someone with a stalled car and saw that the car was filled with sardine cans, because people had been told to take as many non-perishables with them as possible. When my brother saw the Chop Ayam of Clouet & Company, he started to cry. No one knew how Singapore was going to get through those dreadful times. In 1945, Lord Louis Mountbatten was in the port of Colombo, Sri Lanka, gathering a flotilla of battleships because they wanted to take Singapore away from the Japanese. Mountbatten called up Ned and told him, “You will be one of the first to land, because you know Singapore.” As he was preparing to fly to Singapore, Ned suddenly heard that the Japanese had surrendered and the war was over. Ned told me, “It was if they said, ‘Heaven has opened, God has come down.’"
When the Japanese left Singapore, Ned was made Provisional Governor to help put things back in order. During the occupation, the Japanese had taken over the houses and Singapore was in shambles. Ned discovered that the Japanese had used his own house as a news agency during the war. They left behind an old Hebrew prayer book that our mother had given him many years before and thankfully had not damaged it. My brother had to rebuild our father’s business from the ground up. He ended up selling Clouet & Company, just before Singapore became independent and moved his family to San Francisco too. Rosa, my grandmother, had flatly refused to ever leave Singapore, even though we begged her to join us in San Francisco. There she was at age 93, almost blind from cataracts, still living at Siglap when the Japanese first attacked in 1942. Anna, one of her daughters, lived next door with her husband to help care for her. We all thought that if the Japanese did attack Singapore, they would attack from the sea. We telegrammed them to go inland to another house the family owned, to be safer. They moved to the center of town and as fate would have it, that house was one of the first to be bombed. Anna was injured when the tile roof collapsed on her. Later we found out that the Japanese were probably aiming for the house behind them, because it belonged to a British Admiral. Luckily, because of Anna’s injury and Granny’s age, they were given priority to evacuate. It took months for them to arrive in San Francisco, because the ocean crossing was so treacherous. We had a joyous family reunion when they finally made it to San Francisco. Granny was surrounded by three generations of her family, some of whom she was meeting for the first time. On June 10, 1942, The San Francisco Chronicle featured an article about Rosa Frankel’s ordeal and journey here, calling her a “Grand Lady” who Singapore “adored.” Granny vowed to go back home to her beloved Singapore. She never made it and died in San Francisco in April 1945, just before the war ended. Today, no one from our family lives in Singapore. I am told by relatives, who have gone back to visit the Singapore of our youth, that it has all changed. All of our houses and lovely estates are long gone. Singapore is now crowded with people and skyscrapers. They have filled in land to make room for more buildings. If the Frankel’s estate was still there, it would no longer be on the sea, but inland. Only the glorious Raffles Hotel is as it once was. The world may have moved on, but I still have my lovely memories. It was paradise, simply paradise. Much gratitude to the late Alan Frankel, the late Anne Lapporte (Frankel) and Ruth Jean Allen for sharing their memories and for their gift of storytelling and to Harold Clumeck for his extensive scholarly research. 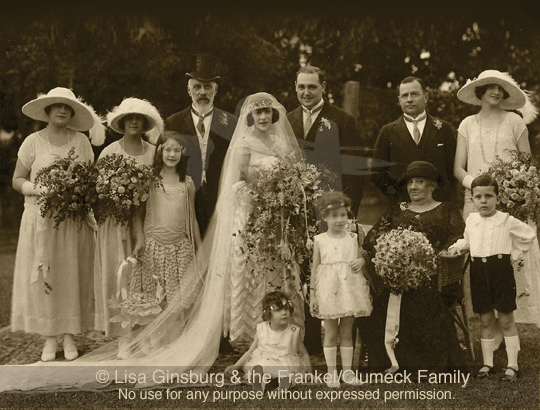 Many thanks, also, to my late grandmother, Annetta Ginsburg (Clumeck) and the rest of the Clumeck-Frankel clan, whose stories continue to inspire and amaze me. All images © Lisa Ginsberg & the Frankel / Clumek Family - no use for any purpose without expressed permission.